In the next few days I'll be submitting my third short story in as many weeks for an anthology. This one, though, might be the one I'm most proud of. Not the story, per se, though I do think it's really good stuff, but it's the most important anthology. 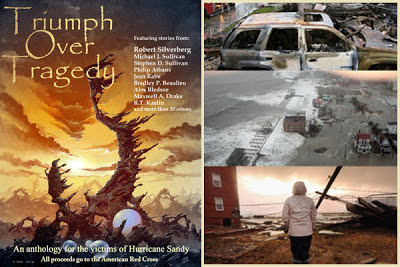 Put together by my friend and author R.T. Kaelin, Triumph Over Tragedy is an anthology that includes more than 40 authors and every cent of the proceeds are going to the Red Cross and relief efforts for victims of Hurricane Sandy. I won't say I was the first author to sign up when the redoubtable Mr. Kaelin cooked up the idea, but I was pretty darn close, and I'm very glad to be involved. 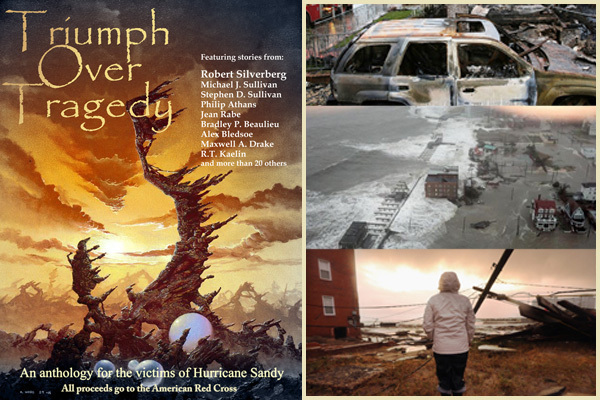 For a donation of at least $7, you can get some very, very cool stories. I'm told more are coming. As of this moment, the anthology has raised over a thousand dollars, I'd like to see you guys double it. Click here to go to the page and donate. The story I'm providing is a science fiction piece in a world I've been building for a long time for an extended stay in. I hope you guys will enjoy an early taste of it.